The selection of Edinburgh’s Dutch winger, Tim Visser, for Scotland's summer tour squad brings the age-old debate about international eligibility to the fore once more. On 12th June McVisser will have resided in Scotland for 3 years and will therefore be eligible to represent the the land of William Wallace. As a reminder, currently a player may play for the country in which he was born, or in which a parent or grandparent was born, or in which he has completed thirty six consecutive months of residence (provided, of course, that he has not already played for either of the top two representative teams or the senior sevens team of another country). So, under the rules, Scotland are perfectly entitled to select McVisser and no doubt rugby in Holland will receive a boost as a result. Nevertheless, as with the smattering of South Africans now plying their trade with England, the selection just doesn't feel right. 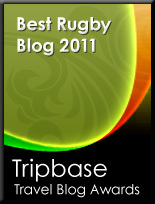 In the modern professional era the IRB's eligibility criteria, particularly the residency qualification (and in some cases the grandparent rule) have meant that, effectively, players end up playing international rugby for a country other than their country of birth, more often than not for economic reasons. Perhaps McVisser's case is not the right example to use as he almost certainly would not have had the opportunity to play top class international rugby for his country of birth (and arguably still won't with his adopted country!) but, unless the eligibility rules undergo a radical overhaul, there is a danger that international rugby will simply lose its soul with each country fielding a multi-national line up of immigrants playing under a flag of convenience. Player development will become pointless - after all, a player could play age-grade rugby for one country and then accept a lucrative 3 year contract in another country and end up switching allegiances. And where is the incentive for a country to develop, say, a new prop when there are already a bunch of, say, South African props already playing professionally in that country and biding their time until they are eligible? The solution? I quite like the system currently being operated by the England & Wales Cricket Board, namely that a player must complete a residence period of 7 consecutive years, unless he arrives in the country as an under-18 (where a 4 year period applies). Would this solve all the problems? No, but a 7 year qualification period would certainly ensure that a player would need to be fully committed to his chosen country rather than just be a transient economic opportunist (where are you now Mr Flutey?). And, while we're at it, let's abolish the grandparent rule entirely to avoid Thomas Waldrom-like situations where an English grandmother was somewhat conveniently discovered in time for the Rugby World Cup last year. I have no problem with players qualifying on residency ground, but the treatment is uneven. For example, as Wales have designated their U21 side as their 2nd team, Shingler cannot now play for Scotland as he has represented the Weslh U21's. However, for say England, the 2nd team is the saxons, so playing for their U21's doesn't have the same effect.